It's the FA Cup, anything could happen. It nearly did at West Brom, it nearly did at Eastleigh and we nearly saw a big story at Old Trafford. Our live matches may well be over but the reaction is not. Paul Scholes has sounded off over Manchester United's failings, you can read that on this website shortly. There's a live text running from 22:00 GMT which will accompany Match of the Day, bringing you all the best stats and reaction to a fine day of FA Cup action. More live texts for tomorrow's games too of course. For now though, thanks for the many texts and tweets, I hope your team is still in it. Ben Peterson: Awful dreadful diabolical boring tedious unacceptable mind-numbing painful excruciating torturous unexciting uninspiring #mufc #bbcfootball. Former Manchester United player Pat Crerand on MUTV: "Sheffield United defended magnificently. Could you see Manchester United scoring? No we couldn't. Not a great performance from Manchester United. "You look at all the cup matches over recent days, the Premier League sides have had nightmares in most of them. There have been crazy results in cups and there will be more to come." 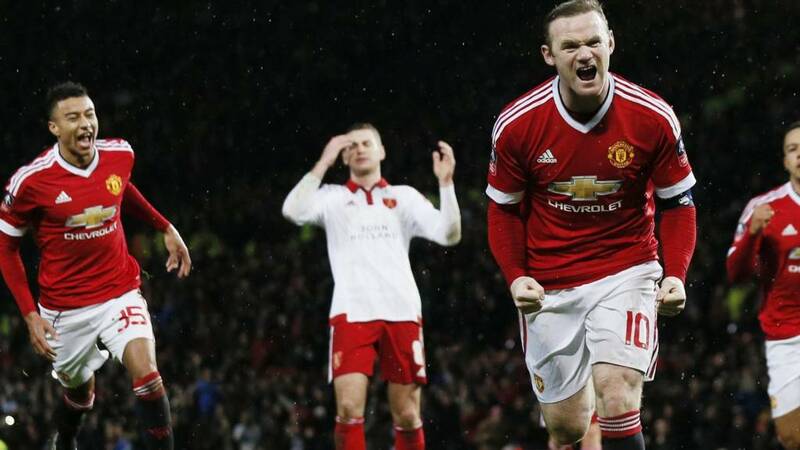 Manchester United manager Louis van Gaal speaks to BBC Sport: "You have to see also how the opponent is playing. Everybody shall give applause to Sheffield United. They were very organised but it is much more difficult to attack than to defend. "Again a clean sheet is also the benefit of our organisation. I'm very disappointed that we are not creating too many chances, that we have to improve." Can you see a run in the FA Cup this season? "We have to play better than today." We hope you're prepared for a late night because tonight's Match of the Day is going to be an epic one. Gabby Logan, Trevor Sinclair and Mark Lawrenson will be your companions between 22:25 GMT and midnight as they review the best of a magical day of FA Cup action. Shuvam Sinha: Memphis Depay the super-sub ultimately making the difference. What a monumental display by the Blades. Deserved a replay #bbcfacup. Maddy Raman: Thumbs up from some players, triumphant wave from Louis van. This is what Old Trafford has become. #SUFC robbed, #MUFC awful. #FACup #bbcfacup. More from Sheffield United boss Nigel Adkins on BT Sport: "The players have worked extremely hard against superior opposition. "The grit, desire and character gave the supporters something to cheer about. "The supporters have got right behind the players and there is a togetherness at the football club." Bastian Schweinsteiger battled on in the closing stages but was in clear pain. A 50-50 tackle on Chris Basham left him sprawled on the deck. When we know more on the injury it will be straight on our website. Surely he will miss Newcastle away on Tuesday? Chris Harvey: #bbcfootball I've just checked, it turns out Manchester United's last 10 half-time scores are actually binary code for "Please get rid of Louis van Gaal". Dave Payn: #bbcfacup I doubt even Victor Frankenstein could inject some life into this Manchester United side. "They better not get a late penalty," reads the Nigel Adkins quote. If you're just tuning in, Manchester United did - the 93rd minute to be precise. "We can improve but how many chances have Sheffield United created? No one is talking about that. Everyone is talking about the fantastic defence of Sheffield United. "Wayne Rooney was the third man. I changed one and two, he was lucky. The fans were waving to me, I waved back, it was politeness. "I don't think it is wise to purchase players in January. When we think he can give us a contribution, of course we shall do it, but normally we don't do that." "Escape from jail? I don't think so. It is always difficult to play against such opponents. "They are defending with 10, 11 behind the ball. You have to play quicker than we did in the first half. "In the second it was a little bit better, we created a little bit more. It is easier to defend than attack. "It was a deserved penalty and we win the match,the most important thing. I said to the boys the most important thing is we are in the second round. "We have to play quicker with the ball." Manchester United played 672 passes to just 279 from the visitors. The Red Devils completed 87% but according to Opta, only seven were classed as 'key' or became assists. Matt in Surrey: In all honesty I couldn't care less if we were battling for the league or advancing in Europe as I take no pleasure in watching my Manchester United play. Complete and utter boredom on the pitch sours any success. I'm not asking to win with overwhelming style but just with a flirtation of a smile. "We have tried to be adventurous early on. Showed resilience and character and injury time we have been undone with a penalty. "Dean Hammond has a desire to keep the ball out of the back of the net. Unfortunately going to ground gives the referee the option to give the penalty. "A replay would have been fantastic. There was a steely resolve and just a shame we haven't got it across the line." Manchester United midfielder Marouane Fellaini: "Most important is we are through. "The other team defended well, we kept the ball well, tried to create chances. We knew it would be difficult but in the end we win."